FORT WORTH, Texas — Over 7,000 Texans gathered here June 8-9 for the state Democratic Party convention. They came determined to overthrow the policies of George W. Bush that devastated Texas long before the rest of the nation felt their teeth. A few delegates may have been confident that they knew how to unite the working class and its allies to defeat the historic right wing. Most others were still looking for strategies. But all were united in one purpose: defeat the Republicans. The plank on foreign policy in the party’s platform said, “America draws its power from the trust and respect of other nations, not only from the might of weapons.” Texans who hoped to see the Democrats speak out clearly against President Bush’s imperialist policies held a peace demonstration outside the Fort Worth Convention Center, the site of the meeting. Inside, they circulated petitions for Bush’s impeachment. During the keynote speech by retired Army Gen. Wesley Clark, some of them protested aloud and held up antiwar signs. 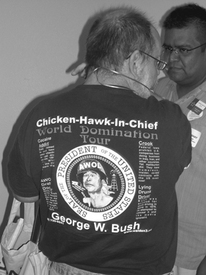 During the previous week, Interim State Chair Boyd Richie publicly declared that the invasion and occupation of Iraq amounted to an “unjust and immoral war.” Richie went on to win election as the party’s state chair for the next two years. At the beginning of the convention, Richie announced that the Texas Democratic Party had successfully sued the Republican Party of Texas and won a temporary restraining order preventing the GOP from naming someone else to fill the spot of former Rep. Tom DeLay on the Nov. 7 ballot. DeLay beat three opponents in the primary to win the GOP nomination. But DeLay, the poster child of Republican corruption, has since resigned from office in disgrace. Republicans are now scrambling to legally justify the naming of a viable replacement. The proposed Democratic Party platform was far to the left of Bush and the Republicans on immigration policies. But in order to make the differences with the GOP even clearer, 10 state representatives formed “Democratas Unidas” and spelled out a strong defense of immigrant rights. Tejanos, Texans of Mexican descent, are expected to return to heavy Democratic Party voting in November because of the immigration issue. Working people of Texas now feeling the vicious bite of right-wing anti-worker economic policies are eager to join the fight for fairness in November.